Friends, I have found a new favorite dessert. In reality, it’s a really OLD dessert – but, I’ve fancied it up a bit, made it into a handheld size (as opposed to a fork and plate size)… and then stuffed my face with them. I feel certain I’ll be making these little treats for many, many occasions to come. So, you’ve probably heard of an icebox cake. In case you are unfamiliar, an icebox cake basically has two ingredients – chocolate wafer cookies, and whipped cream. You alternate layers of chocolate wafer cookies (they are basically thinner, crispier versions of the cookie part of an oreo), with layers of slightly sweetened whipped cream until it has reached a respectable cake height, and then you pop the whole thing into the fridge (the “icebox” if you will) to let it work its magic. As the cake sits, the whipped cream gently softens the crispy cookies – and before too long, the cookies have softened enough so that they resemble the lightest, airiest layers of cake. I have been thinking about making an icebox cake FOREVER, and I’ve just never gotten around to it. I’ve even had some chocolate wafer cookies sitting in my pantry! But it wasn’t until a few months back (uh, maybe more like a year or so? ), when I walked into Trader Joe’s and spied several flavors of their super thin, super crunchy Cookie Thins that my wheels really started turning. About a month ago, Trader Joe’s introduced their NEWEST Cookie Thin variety – Toasted Coconut. As you are all well aware, I love me some coconut-flavored anything, and these things are coconut heaven. They are rich, and buttery, and coconutty, and just delicious – and upon trying them for the first time, it suddenly occurred to me that they would make an excellent non-traditional icebox cake! And thus began my week-long obsession with icebox cakes, resulting in three delicious varieties. I am going to show you the recipe for the traditional icebox cakes, with the substitutions for the other varieties at the end. If you don’t happen to live near a Trader Joe’s, and therefore are unable to purchase the TJ’s specific products I’ll mention, then a.) I feel really, really badly for you, and b.) call me, and I’ll ship you a care package of TJ’s supplies. Seriously. *I’m here to tell you that these wafers are a pain in the rear to find – not in the sense that no one carries them, but in the sense that they cannot be found within the store. You might think they’d be shelved with the other cookies, but you would be wrong. So, I’m gonna do you a solid here and tell you that these cookies live with the ice cream toppings – yes, you read that right. Rather than living with the cookies, which would make a boatload of sense (given that they ARE, in fact, cookies), they live with the ice cream cones and hot fudge topping, and whatever else you might put on your sundaes. You’re welcome. 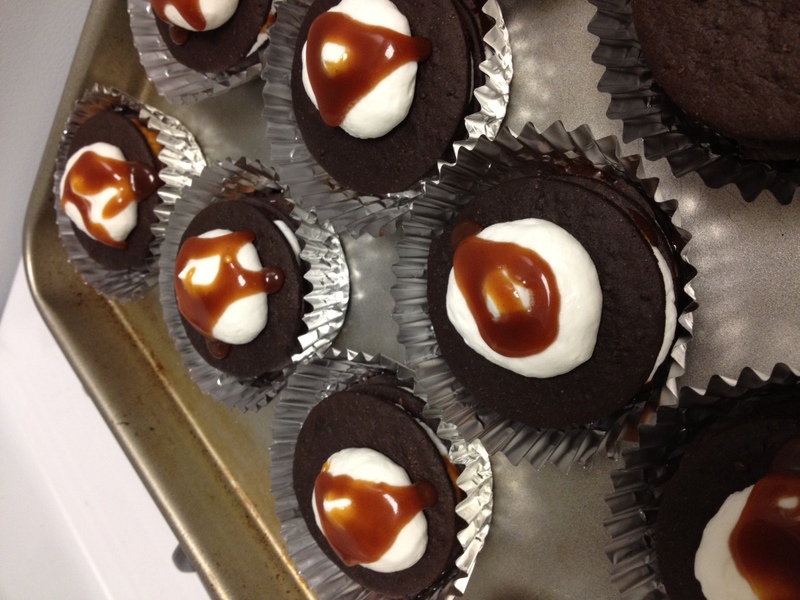 **I used Trader Joe’s Fleur de Sel Caramel Sauce for these, because it is amazing. Again, if you don’t live near a TJ’s, any regular old caramel topping with do (just be sure to have some sea salt on hand for sprinkling, if you want the salted caramel taste). 1.) First, you’re going to want to make your whipped cream. 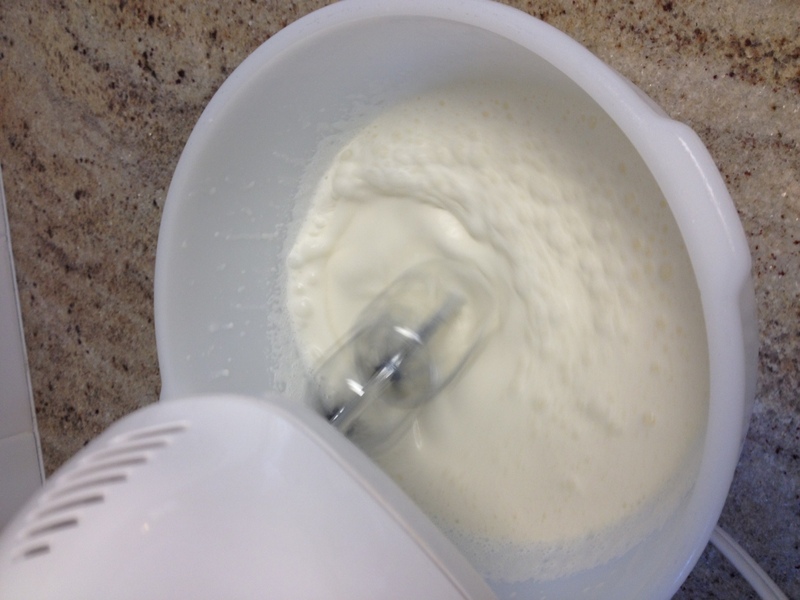 I always start by popping a BIG mixing bowl, and my hand mixer beaters, into the freezer. Just about 15 minutes in the freezer gets them nice and chilled, which helps your cream whip up faster. Also, make sure you leave your cream in the fridge until you’re ready to start whipping it! 2.) 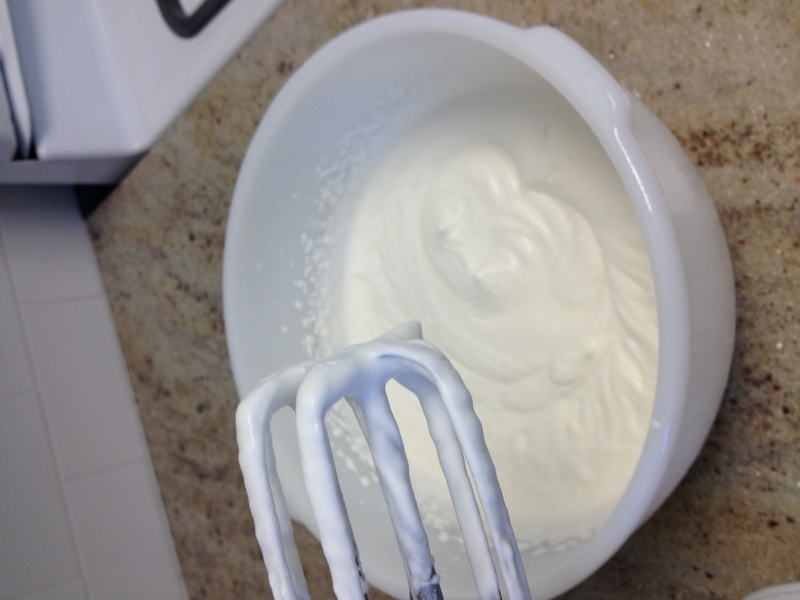 Pour the cream into your large mixing bowl, and start beating it on low with a hand-mixer (you could also do this in a stand-mixer with the whisk attachment, or with a handheld whisk – but unless you hate yourself, I don’t recommend option 3. I’ve been there, it ain’t pretty.) Right away, you’ll see lots of small bubbles start to form – that’s good news, as the point of whipping heavy cream is to incorporate air into it! After a couple minutes, you’ll notice that the cream has slightly thickened, and grown in volume – when you notice that, you can increase your mixer speed to medium-low. Very slightly thickened, with lots of bubbles. 3.) Keep increasing your mixer speed every couple minutes, as the cream thickens. Be sure not to increase the speed too soon, as high mixer speed + heavy cream that is too thin = the culinary version of the 90s craft Spin Art, all over your shirt. Trust me. Fully whipped and ready for piping! 5.) Now it’s time to start making your cakes! Unfortunately, the chocolate wafer cookies do NOT fit into a standard size cupcake liner – so, you have two options: first, you could buy jumbo cupcake liners and use those. Second, you can buy foil cupcake liners (not the ones that are just silver or gold printed on paper, the ones that are seriously made of foil, and have the paper liners separating them in the package) – if you take your thumb and just gently run it around the bottom edge of the foil liners, it’ll flatten out that last 1/4 inch or so of the sides, giving you a wider base to work with, so the wafers will fit! 6.) 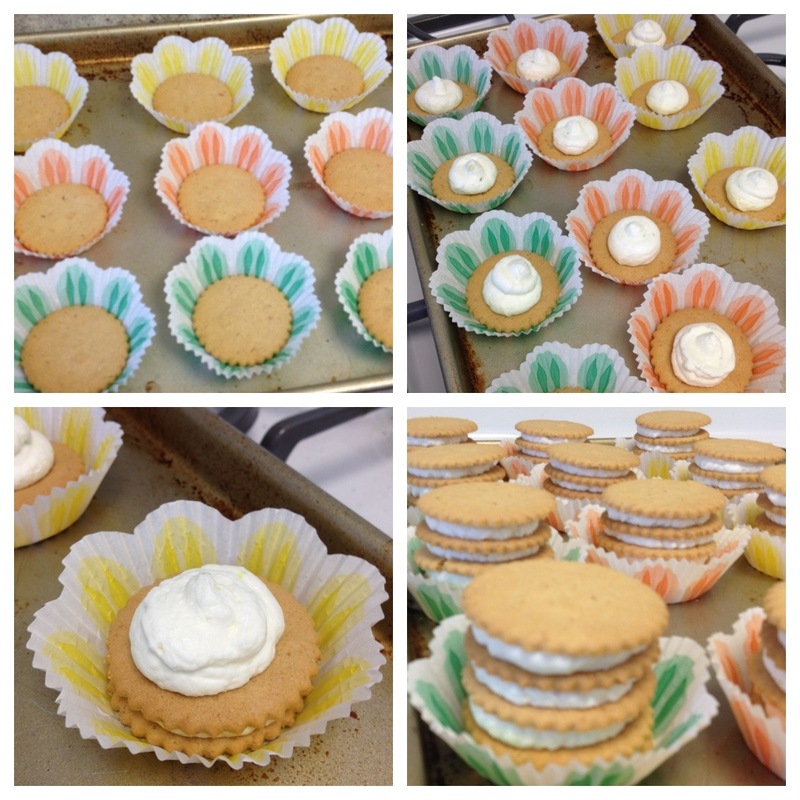 Place one wafer cookie in the bottom of each of your cupcake liners. Then, load your whipped cream into a ziploc bag, or plastic pastry bag, and snip off an opening about 3/4″ wide. 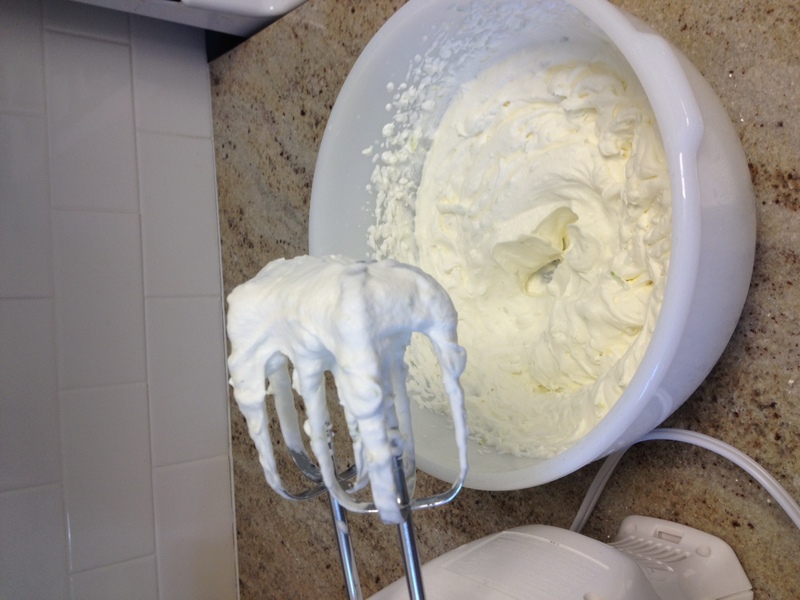 Use this to pipe a big dollop of whipped cream onto each cookie. After you’ve put the whipped cream on each cookie, take your caramel sauce and drizzle it over the cream (just near the center – you don’t want it spilling all over the edges). You can either use a spoon to do this, or you can pour your caramel into a ziploc bag or pastry bag, and use that to drizzle the caramel. Be sure to cut a much smaller opening – about 1/8″ – for the caramel, so it doesn’t go pouring out of the bag all over the place. 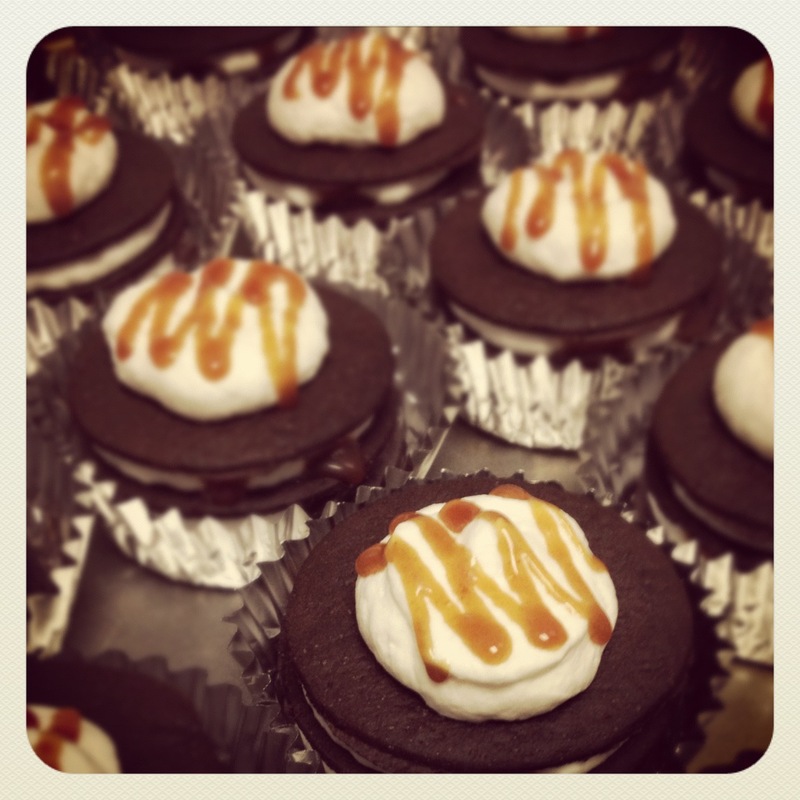 Layers of whipped cream and caramel. 7.) Repeat this until you have 4 layers of everything – as you add the cookies on top of the whipped cream and caramel, very gently press them down, so that the whipped cream will spread out toward the edges of the cookies. 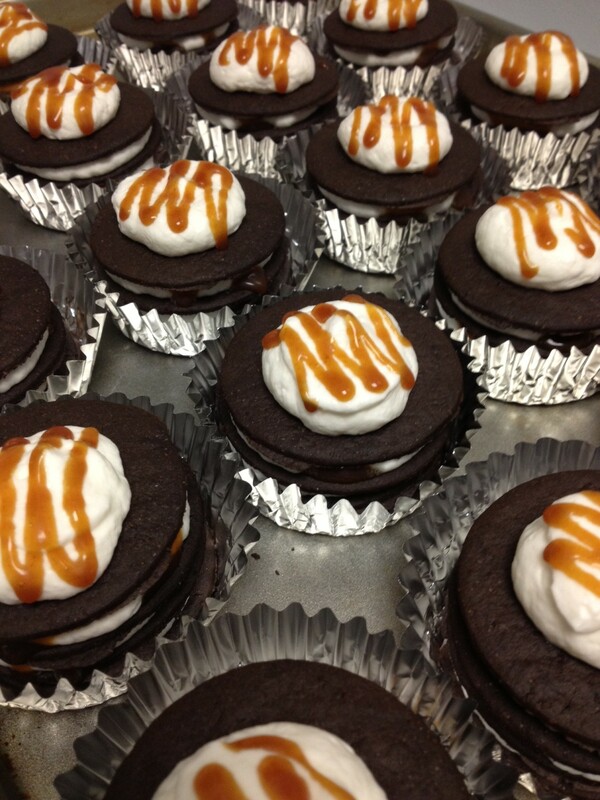 You will end your layering with a dollop of whipped cream on top of the last cookie, drizzled with caramel sauce. I tried to make the caramel on my top layer look a little prettier than the hot mess I made inside all the layers, but it doesn’t matter much, as they’ll taste delicious regardless of how messy your handiwork is! 8.) Place the cakes into the fridge so that the cookies can soften – they should be refrigerated for at least 4 hours, and up to 24 hours. For real, these taste like the most delicious cookies and cream cake you’ve ever eaten – they’re just slightly sweet, and they have a hint of salt from the caramel, and they are just heavenly. I made them for a friend’s 30th birthday celebration this past weekend, and I forced everyone at the party to eat them all so I wouldn’t have to take any home… and then I spent the rest of the weekend being UNREASONABLY SAD that I didn’t have another one to enjoy. It was kind of pathetic, if we’re being honest. – Coconut and Lime. 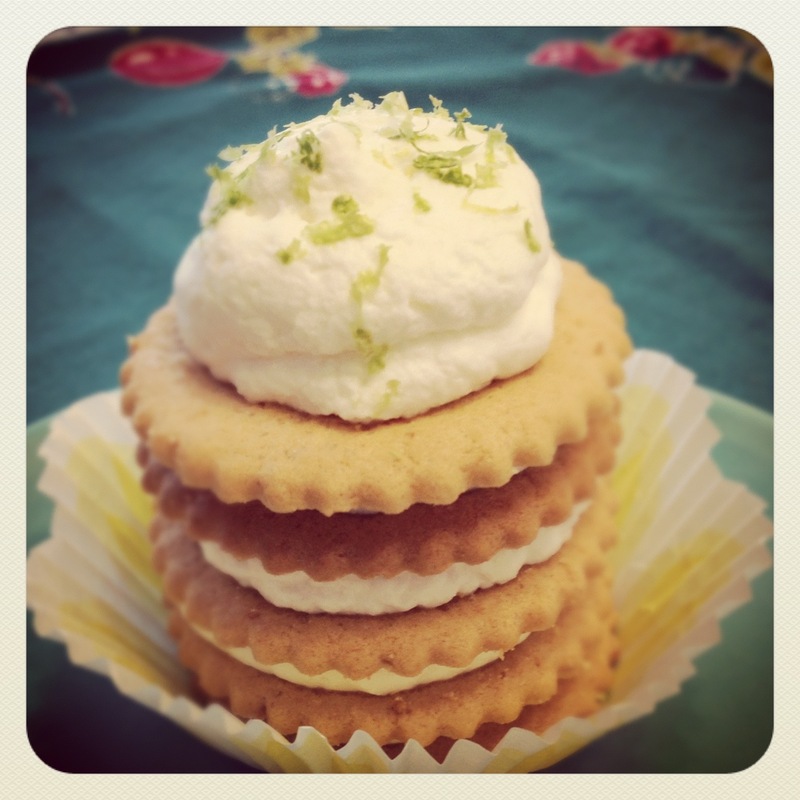 These are also amazingly good – use the Toasted Coconut cookie thins from Trader Joe’s, and mix 3 limes worth of zest into your whipped cream. Add a touch more lime zest on to the top of each one for garnish. – Orange Ginger. Use the Triple Ginger cookie thins from Trader Joe’s, and mix 1.5 oranges worth of zest into your whipped cream. Sprinkle some orange zest on top for garnish. If you don’t have access to a Trader Joe’s, you can use any other really thin cookie you can find – just keep in mind that they need to be REALLY thin in order to work properly. You can play around with flavor combinations, too – you could use orange zest-flavored whipped cream with the chocolate cookies, or sprinkle some coconut between the layers of plain whipped cream and chocolate cookies. There are many delicious possibilities. I cannot wait to try these! Given my fear of baking – and this involves NO baking – it’s a match made in heaven. I don’t have a TJ’s near me but word is they are set to open in Austin at some point. Maybe y’all should plan a Texas trip with boxes of TJ groceries for resale – you could make a fortune!!!! Yes, these are a wonderful no-bake dessert! You only have to concern yourself with not accidentally splattering your entire kitchen with heavy cream (not that I did that, certainly). I am serious, I will mail you a TJ’s care package if needed… just say the word! I’m saying the word – I need more coconut cookies.